Should you wait until WordPress 5.0.1 or is it a good idea to update your WordPress version right away? WordPress has just released the brand new block-based version 5.0. Like WordPress says – it is the first step toward an exciting new future streamlined editing experience. 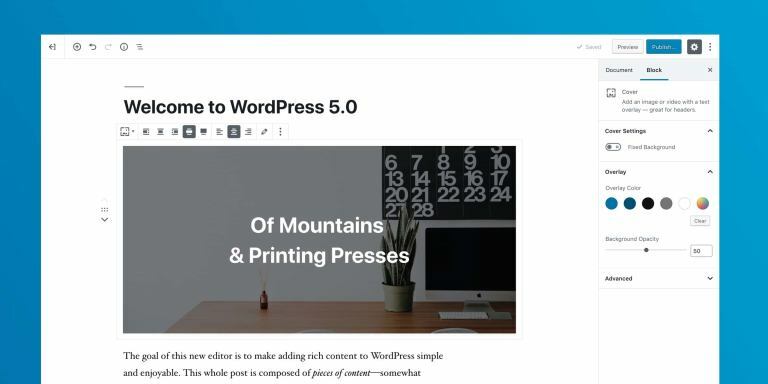 It’s been said that updating to WordPress 5.0 offers more flexibility and the block-based editor won’t change the way any of your content looks to your visitors. And if you’re more of an HTML and CSS sort of person, then the blocks won’t stand in your way. The answers to the question if developers will be updating to WordPress 5.0 or going to wait until 5.0.1 or 5.0.2 vary. Some say that even with the most complicated sites WordPress 5.0 worked flawlessly. It did not change any custom post types with custom meta boxes and all in all the feedback seems to be pretty good. Others state that it’s usually good to wait a bit after a big release to see the bugs and update later when the bugs are fixed and updated – so they will wait. But who’s right? Before updating it’s important to have your backups. Since there are so many custom sites and setups that may be affected there can be a small chance that updating will break something on your site. Secondly, some plugins need extra care. It can be possible that some plugins may cause some issues together with Gutenberg. Especially important is to check if it works with page builders you may be using (SiteOrigin; Visual Composer; Elementor and WPBakery announced that they are compatible with WordPress 5.0). Most used WordPress plugins like WPForms and Yoast SEO are already compatible with WordPress 5.0 and the new editor. The third thing is to test if your theme is compatible with Gutenberg. It’s a good idea to test it out with your theme in a testing environment to see if it breaks something. Gutenberg introduced blocks provide a comfortable way for users to change content directly, while also ensuring the content structure cannot be easily disturbed by accidental code edits. This allows the developer to control the output, building polished and semantic markup that is preserved through edits and not easily broken. The advantage is a wide collection of API’s and interface components to easily create blocks with intuitive controls for your clients. Utilizing these components can speed up development work and also provide a more consistent, usable, and accessible interface. With the unified block insertion flow, it’s easier for clients and customers to find and use blocks for all types of content. Developers can focus on executing their vision and providing rich editing experiences, rather than fussing with difficult API’s (source). The main new addition to WordPress 5.0 is support for the newly released PHP 7.3. This version of PHP will be officially supported until the end of 2022, and WordPress 5.0 was specifically built to work on top of it, mainly due to the performance boosts it allows. The current version of WordPress core is 4.9.8. If you remain on this version, you will continue to receive security updates from the WordPress core team. The current policy of the WordPress security team is to backport security fixes to all auto-update compatible WordPress core versions. That means that all versions of WordPress core will continue to receive security updates all the way back to WordPress 3.7. This is not an open-ended policy and may change in the future. When you upgrade, please, as always: make a backup. Use staging environment and if you don’t have one, and your site is critical to your business, get one. This goes usually for every major software release. If some of your plugins or themes are not working properly with WordPress 5.0, then reach out to that plugin or theme developer and ask help directly. In terms of compatibility – WebARX is fully compatible with WordPress 5.0, but make sure you check other plugins and see if they are compatible before updating to WordPress 5.0.